Did You Know, Mickey King was sister to famed circus aerialist Antoinette Concello. Gertrude "Mickey" Comeau, her sisters, Antoinette and Rose Alma, and her brothers, Joseph and Edwin Tyler (known as Teddy), were born in Sutton, Quebec Canada one more brother Clarence was born after the family had moved to Vermont. During Mickey's teen years she became restless and dissatisfied with her life. 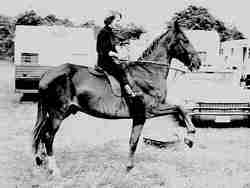 Then in 1923 when the Sells Floto Circus came to town,. Mickey and a friend snuck into the tent but were caught by animal trainer Terrell Jacobs. Rather than throw the pair out he told them that the show had been looking for girls and they should apply for a job. Mickey, at age 17 went home, forged a note from her mother and with nothing but the clothes on her back, hitchhiked to join the circus. 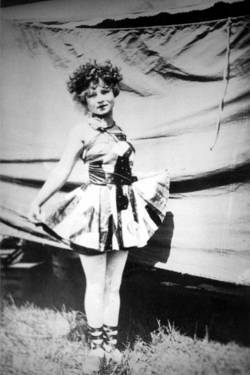 Mickey was hired by show manager George Myers as a sideshow "Bally Girl". This was the beginning of a long and wonderful show business career. 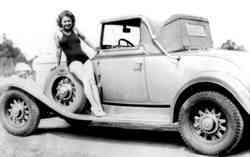 After working as a bally girl for sometime she was noticed by Eddie Ward of the "Flying Wards" trapeze act (Eddie produced and trained many flying acts for different circuses). Eddie was impressed with her strength and agility and moved Mickey into the act. During that winter Mickey stayed at Eddie's training camp in Bloomington, Illinois, (after the death of Eddie, the camp was purchased by Art Concello who continued to train acts there). Many acts have trained at this facility started by Eddie, they include; The Flying Wards, Flying La Vans, The Three Aces, Flying Flemings, The Aerial LaFayettes, The Flying Concellos, The Artonies, The Flying Comets, The Flying Valentines, The Five Fearless Flyers and The Flying Corderos. Mickey once said `There was no other town in the whole wide world that had so many flying acts training there". In 1924 Mickey met and married Allen King, an animal trainer with the show. She left the Flying Wards in 1925 to follow her husband to the Lee Brothers Circus, but left Allen and returned to the Wards the following year and continued with them until the death of Eddie Ward in 1929. 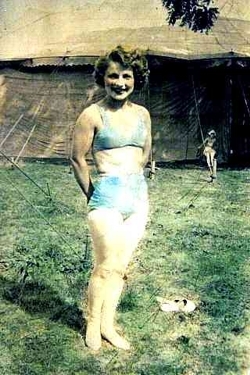 After the death of Eddie, Mickey began working on her single trapeze, "one arm flanges" and roman rings act. The next season she began performing her solo act with the Robbins Brothers' Circus. Mickey thrilled audiences for many years and many different circuses until her retirement in the late 1960s. She is considered by many to have been one a the greatest aerialist to perform under the big top.